Armed with only books and pencils, the superhero of Pakistan’s first animated television show is the Burka Avenger: a schoolteacher named Jiya who wears a burka to disguise her identity as she fights evil in the fictional city of Halwpur. The 13-episode show (running 22 minutes) aims to send positive messages to its young audience, and from the first trailer – and the given profession of its hero – it seems the value of education is its central theme. When one of the show’s main villains, Baba Bandook decides to close down the city’s school, the Burka Avenger shows up to defeat him. Bandook’s mission is to fight for ‘progress’ in Halwpur. The show is especially poignant right now and is an act of defiance against the Taliban, which continues its campaign to keep young women and girls out of the classroom. Since 2009, more than 800 schools have been bombed. Most famously, the group claimed responsibility for the attempted murder of teen activist Malala Yousafzai last October. She was shot in the head and underwent surgery and rehabilitation in a British hospital. Yousafazi has become a figurehead for women’s rights and education in Pakistan since surviving the attack last year and is continuing her work, despite the threats on her life. The attempted murder was supposed to silence the 16-year-old’s advocacy for girls’ education in her home country but instead has brought the issue to international attention. She has been nominated for the Nobel Peace Prize. It’s difficult not see Yousafazi in the character Ashu, who idolizes her teacher and is described as ‘intelligent and confident’. She wants to become a doctor or teacher one day and is concerned about the girls’ school in her city. Creator and singer, Aaron Haroon Rashid (known simply as Haroon) told the Associated Press that he created the show to help reinforce the importance of girls’ education. 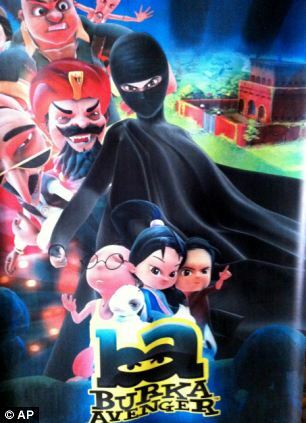 While education is not the only battle being fought in Burka Avenger, it’s refreshing to see two strong animated female characters where most of the Western world (including feminists) sees only oppression. As for the burka, Rashid said it was a logistical choice and not meant to have any underlying message or to perpetuate any stereotypes about women in the Middle East. ‘Since she is a woman, we could have dressed her up like Catwoman or Wonder Woman, but that probably wouldn’t have worked in Pakistan,’ he said. Burka Avenger will include a music video, an iPhone app and a soundtrack featuring some of Pakistan’s biggest musical acts. This entry was posted in News and tagged education, in brief, Pakistan, progress, women. Bookmark the permalink.